Michael Douglas' father, Kirk, has urged his son to patch things up with Catherine Zeta-Jones before it's too late. 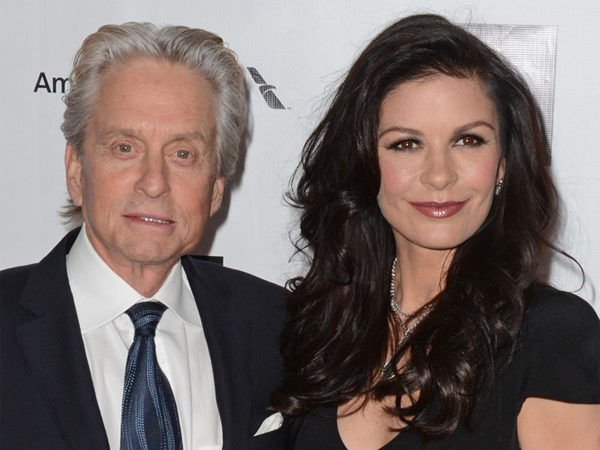 Michael Douglas' father has urged his son to patch things up with Catherine Zeta-Jones. The Hollywood couple called time on their union earlier this week in order to "evaluate their marriage", but Michael's dad, 96-year-old Hollywood legend Kirk Douglas, has begged the Wall Street: Money Never Sleeps star to save his relationship before it's too late. A source close to the family told The Sun newspaper, "Kirk likes Catherine and has told Michael to sort his problems out. "He's been with his wife, Anne, for almost 60 years and thinks marriage is about sticking with someone through good and bad." Neither Michael nor Catherine have made any movements to file for divorce or legally separate and are said to be working through their differences. A friend of the couple said, "Michael is still talking to Catherine and their family and friends are trying to help them work through their issues." The pair's 13-year marriage has been rocked by numerous stresses in the past three years with Michael being diagnosed with throat cancer in 2010 ? which he beat ? and Catherine suffering from bouts of bipolar II disorder, most recently in May this year. The Rock of Ages star is reportedly seeking guidance from a counsellor as she wants to do everything in her power to make sure their marriage is back on track as soon as possible. A source said previously, "Catherine has already spoken with a marriage guidance expert who now wants to see them individually and together. She is painfully aware this could be the last throw of the dice." I'm a 28 year old woman looking to meet men between the ages of 45 and 100.